I don’t do political rants. First, because I believe the most important races are for school board and town council and no one wants to read about those. Second, because political rants alienate half your friends. The good news is that I have found a way to alienate 100% of my friends, making it possible for me to put up the first, and probably only, political post you will ever read from me. How does one make everyone angry? First, to say I like Obama. Those are “fightin’ words” to half of America. Second, to say, “He duped me and everyone else on his email list.” Those are “fightin’ words” to the other half. How were we duped? 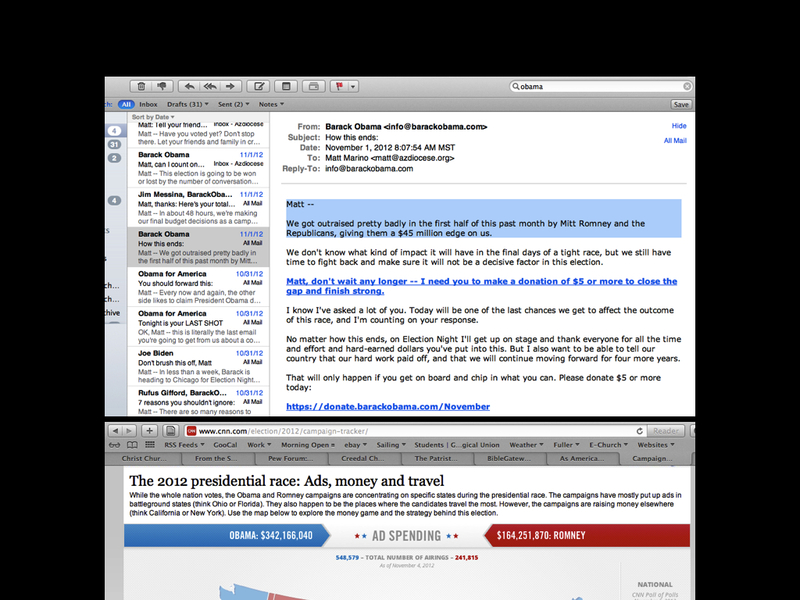 I received multiple emails like the one on top from the Obama campaign urging me to give immediately because of how badly the campaign was being out-fundraised by Romney. Tuesday night CNN ran this graphic revealing that the President not only wasn’t desperately behind in fundraising, but Obama actually outspent Romney 342 to 164 million dollars. Days before the end of the election and I was being told of an urgent need to “get on board” financially when in actuality the President was outspending his opponent by 178 MILLION dollars – more than a 2:1 margin. We live in a great country. We listened to two good men campaign on different solutions for our problems. We went out and made our choice. I just wish telling the truth were held in higher regard in the process.